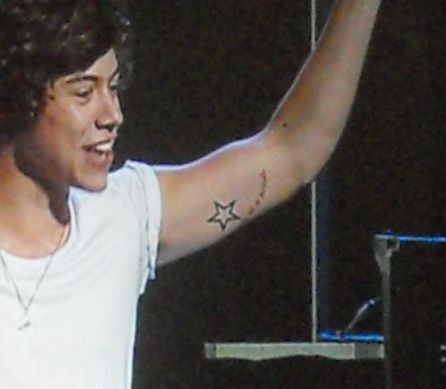 The One Direction star - who already has several pieces of body art including a star, the letter A, and a clothes hanger - has revealed he got the words "Things I can" inked on the inside of one arm, and "Things I Can't" on the other. The 18-year-old 'Live While We're Young' singer told Irish chat show 'The Late Late Show' last night: "I've got one on my arms here [pointing to inside of arms]; I got it today." Harry declined to show off his markings saying they were still bandaged up and did not explain what the new tattoos mean. But his bandmate Niall Horan dryly said: "It's a London thing." Harry wasn't the only member of the successful group to get tattoos in the city. Louis Tomlinson told fans on twitter that he and Liam Payne both got matching tattoos of screws yesterday, to match existing ones already inked on their bandmates Harry and Zayn Malik. Meanwhile, Harry revealed he is not looking for a girlfriend but wouldn't hesitate if he found the right girl. He said: "It's not like I'm looking for someone, I just think that if I met someone who I liked, then yeah. I've never lied about having a girlfriend. I think if you lie, people just want to prove you wrong, so you might as well tell the truth."